cashdoctor.com - Crowdsourcing can find you the physician you seek or avoid "rotten tomatoes"
For starters, Dr. Oliva’s opening analogy between the impact of Rottentomatoes.com site for the moviegoer community and the predictable appearance of a similar platform for a community of patients seeking good doctors (and, correspondingly, to avoid mediocre to incompetent ones). The analogy is really apt: once Rottentomatoes.com started going, it didn’t take long for it to become one of the top sites to go and find out a pretty reliable feedback about almost any film there. Not convinced? Dr. Oliva cites a new 3,000-person survey from Nuance showing that 70 % of patients aged 18 to 24 choose a primary care physician based on recommendations from family and friends. Even among patients over the age of 65 (traditionally considered more conservative and reluctant to adopt new technologies) this decision-making heuristic is quite prevalent, reaching up to 41 % of this age segment. Further, when the survey looked the preferred strategies patients use when unsatisfied with their health care, data showed that crowdsourcing is on the rise especially in the younger adult segment: fully 60 % of patients aged 18-24 tell their friends. 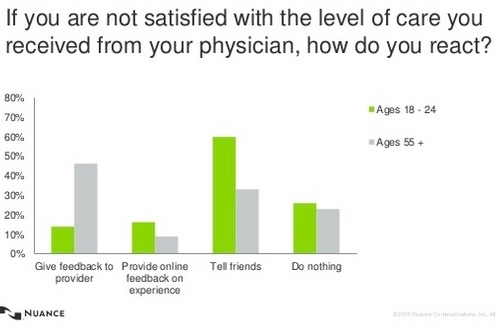 Add to the that the fact that 54% of young millennials (aged 18 to 24) say they search online for health information and rely on online physician ratings before seeing a doctor and are more than twice as likely as people 55 and older to trust others personal recommendations when it comes to choosing a doctor. While this may come as a surprise for (some) healthcare practitioners, it has been known for a while that millennials find online product research and user review browsing while shopping as default or normal part of the decision making process. It comes only natural to them to apply to healthcare as well. In fact, the prediction that "online patient reviews of hospitals and clinicians will increasingly drive business" is not prediction at all. Not only CashDoctor.com, but many others were saying these things long before this pattern became apparent. "We know a huge number of patients today are looking up symptoms and health information online, so it’s just a matter of time until they shop for physicians and communicate grievances that way, too", Dr. Tony Oliva, national medical director at Nuance, said in a statement. We agree. When CashDoctor®, Inc. was founded by Rob Stehlin in 2003, he foresaw a crisis coming in healthcare and how consumers would be consumed with increasing cost and lack of information. The first model was based on the participation of doctors, hospitals, and healthcare professionals. This model failed to develop because the healthcare industry did not foresee the value in consumers being able to see the actual cost of services and allowing consumers to comparison shop. From this revelation comes the NEW CashDoctor® 3.0 - CONSUMERS sharing information while taking control of the healthcare model in their OWN community for their own benefit. CashDoctor is saying no to Insurance company control. We are saying no to hospital control and we are saying no to Doctor control. CashDoctor® is SAYING YES to consumer SHARING and CONTROL of healthcare.